I started the year being invited to give a talk about my practice and recent projects at Manchester’s cultural venue, HOME. I then began a year-long collaborative project with a sculptor, Sarah Smith, and sound artist, Caro C. ‘Nature, Skin and Bones’ took us walking around the Yorkshire Dales, up hills and into caves to explore our connection with nature and the land, together with addressing our transient place in the world. The project culminated in an immersive installation at the National Parks Museum, Hawes from October – December 2016. It was an interesting collaboration as even though we took main control over our specialist parts (light, sound, sculpture) we spent a lot of time discussing the symbolism of the work, the collective effect we wanted to give upon entering the space. Caro and I had a word jam to be included in the sound work, I ensured my lighting was not merely to illuminate Sarah’s wonderful sculpture but to add to the entire effect of the piece. Simple lighting made the moonlike drum glow from within, spotlights picked out flecks and shadows of ancient stones and a stone pool of water, plus a simple low level bulb cast shadows of the work across the space like in a cave. Visitors’ shadows would also be cast across the space, making them a fleeting part of the work. Feedback was extremely positive, many felt the space was meditative and it slowed them down to become more present and inquisitive. A longer film about the project will be presented in the new year. I had my work picked up by the popular online magazine The Creators Project and they wrote a lovely article here. This project won ‘highly commended’ at the University of Manchester’s Making a Difference Awards 2016. After the final exhibition I organised a symposium about the project and arts and health issues at The Whitworth Art Gallery. We had presentations from participants and artists, panel discussions including experts from Arts Council England, University research specialists, stroke consultants and NHS directors. This was an excellent round up of the project but it also started a wider conversation about the benefits of this type of work with survivors of stroke that will be continued well into the future and I’m excited to be a part of helping to implement. Another continuing project is my work co-directing Manifest Arts. This year was the year between festivals (Manifest Arts Festival is biennial) so we turned our attention to a new way of manifesting (!) arts in the North West and obtained Arts Council England funding to conduct a series of interviews with artists working in the North West for our Manifest Arts Podcast series. We interviewed many artists, curators and gallery directors. Find out more and access the interviews here. The series proved so successful that we are continuing to conduct interviews for the podcasts into the new year. Also as part of Manifest Arts, we had Manifest at The Manchester Contemporary, the largest art fair of its kind in the North of England. We promoted the festival and represented and sold the work of two North West based artists we feel are creating exciting and interesting work at this time. We chose fine artist, Helen Wheeler, and fine art photographer, Lucy Ridges. Find out more about them and the Manchester Contemporary here. In September I was fortunate to have my work DREAMERS shortlisted for the prestigious international lighting awards, the Darc Awards in the ‘Best Light Art (Low Budget)’ category. Depending on how you moved around the piece, the poem could be read in different permutations and still make thematic sense. I also created ‘I Waited’ in response to the loneliest bench in Blackpool. A man stands looking out to sea but all that is left is his shadow. A work about love lost, anticipated or unreciprocated (depending on your viewpoint). I was so pleased with the public response to both works, to create something that made visitors look at the often overlooked spaces anew. I met with lighting company, Megaman, to discuss my journey into becoming a light artist. They published the interview here. This year has been full of variety, which is just what I enjoy in my work. I’ve learned new things, met many new people and been so pleased with the reception to the artwork I’ve created and curated. Plans are starting to shape up for 2017 and I’m excited to see what it will bring! Happy new year! Here’s a short video about a new collaborative project I’m involved in. I’m working together with a sculptor (Sarah Smith) and sound artist (Caro C) to create an immersive installation in the Dales Countryside Museum. It’s a new experience for me as I have not collaborated in this way before. The process and the collaboration has led to the work being rather different to the more minimal style I’m used to creating in my solo installation pieces, particularly as the sculptural elements are being made by another artist and there is the added element of an immersive soundscape. I’m looking forward to the final install early October, more updates closer to the time! ‘The Stories Under Our Feet‘ are ephemeral light and text artworks trimming the edges of the benches that surround Manchester Central Library. I developed a series of short observational poems drawing on changing weather and seasons to create moments of contemplation for people walking by or sitting on the benches. The piece was developed for the Enlighten Manchester Festival of Light and Sound Art 2015 and was funded using public funding through Arts Council England. I was pleased with the positive public response to the work. So many people stopped to slowly make their way around the benches to read the poems, smiling once they’d completed the set and commenting on how nice it was to see engaging artwork in the public domain. I changed the piece each night to shuffle the poems and show a variety. The light and shadow cast changed each night also, sometimes easy to read, other times a little more difficult and erring more towards the aesthetic of the feathery light and shadow effect. I like people to engage with my work and I also like to slow them down from their daily lives if only for a few moments. For some, they only noticed the attractive lighting effect, whereas others spent time reading the poems more carefully. Going off the feedback at the time, it seems something positive was gained from both types of encounter. You can see more pictures of the work on my website here. I also created another piece “Lost and Found“: understated light and reflection pieces activated by the viewer. Passers by interrupt the reflection to become either ‘lost’ ,‘found’ or sometimes both to highlight the search for sense of self and connection between people. One visitor told me that she lost her little boy in the library on the visit and found him at my piece – he’d positioned himself so that he had ‘lost’ projected onto him. She said once she’d found him, she took a picture of him with the word ‘found’ on him instead. Great to know my artwork helped to reunite the two, but also that it was easily understood and interacted with! Many thanks to John Lynch for the photos, and to Enlighten Manchester/Curated Place and Arts Council England for their support in realising these pieces. I will be exhibiting two new commissions at this year’s Enlighten Manchester Festival of Light and Sound Art 2015. Last year’s festival was held in Piccadilly Gardens and I was fortunate to have the famous Tadao Ando concrete wall as my site to respond to. The work ‘A Solid Wish Scatters’ was named as a public favourite in Mondo*Arc Magazine. Last year’s piece – A Solid Wish Scatters. Photo credit J.Lynch. This year, the festival has changed site to Manchester Central Library and the Bridgewater Hall and is mainly indoors. However, I have been given another prominent outdoor site to respond to: the Manchester Central Library benches that surround the building. ‘The Stories Under Our Feet‘ are ephemeral light and text artworks trimming the edges of the benches. Short observational poems drawing on changing weather and seasons to create moments of contemplation for people walking by or sitting on the benches. I have also created an indoor work, ‘Lost and Found‘: understated light and reflection pieces activated by the viewer. Passers by interrupt the reflection to become either ‘lost’ ,‘found’ or sometimes both to highlight the search for sense of self and connection between people. Also on show will be pictures produced in the special creative writing and light art public workshops I ran at the library during October. The festival runs in the late afternoon/evenings of Thursday 10th – Saturday 12th December and free tickets can be booked online. I’ve previously written about my admiration of the UK’s largest light festival, Lumiere Durham. The wonder and magic that the festival creates in the picturesque northern city is an inspiration to me as an emerging light artist. It has also certainly been one of the biggest influences in my artwork development and desire to create large-scale light art for the public realm. I often wondered what I’d do if got the chance to exhibit there, and this year I got the opportunity! Large letters of mirror and steel were scattered across the grass and cast shadows onto a screen. It was a sculptural space for visitors to explore and become a part of the work as either participant or viewer. A light wash from behind the letters cast their shadows onto the screen to spell the word DREAMERS along with the shadows of the visitors that animated the space with their bold light and shadow play. I was so pleased with the visitor reaction to the piece. People immediately understood the work and often spent a long time in the installation trying out different shadow effects. The space was filled with joy and laughter and it was a pleasure to see how imaginative people were with the work. There were tugs of war, dance routines, bicycles, umbrellas, kisses, hugs and many more poses throughout the weekend as each visitor cast their fleeting shadow on the screen. Visitors getting creative with their shadows! I think play, joy and wonder are essential parts of our lives, so to facilitate that feeling in any small manner within a piece that I create brings me much joy also. 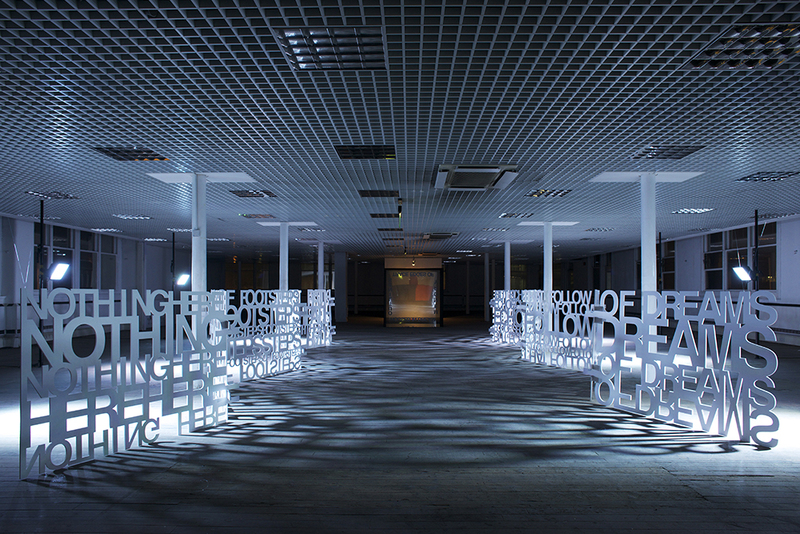 With a lot of my work I create immersive spaces that incorporate text, light, shadow and sculpture. It is often inspired by themes of transience, the nature of happiness and hope. This year’s Lumiere was as exciting and wonderful as always. There were some amazing installations across the city, which I was also lucky enough to explore on the final night. I feel honoured to have been a part of it and it continues to inspire me to create more work. Many thanks go to the festival producers, Artichoke, and to the generous support of Dyer Engineering who manufactured the work. Next up to show at is the Enlighten Manchester Festival of Light and Sound Art, 10th-12th December, for which I have received support using public funding by the National Lottery through Arts Council England. This year I made what only existed in my mind into a reality. There’s not much more an artist can ask for, really! Here’s a recap of my artistic year gone by. 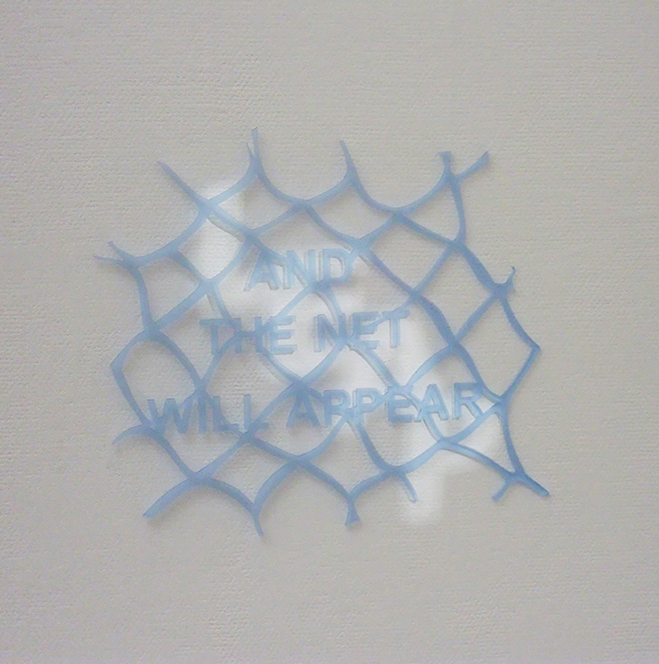 In January my degree piece ‘Leap and the Net Will Appear’ was still on show as part of the Nesta Art Showcase, selected from a national call out to be exhibited in central London at the Nesta gallery space. In February I continued to be part of the DIY Art School, a year-long project by art school graduates wishing to continue the momentum of creative learning in the year after graduation. 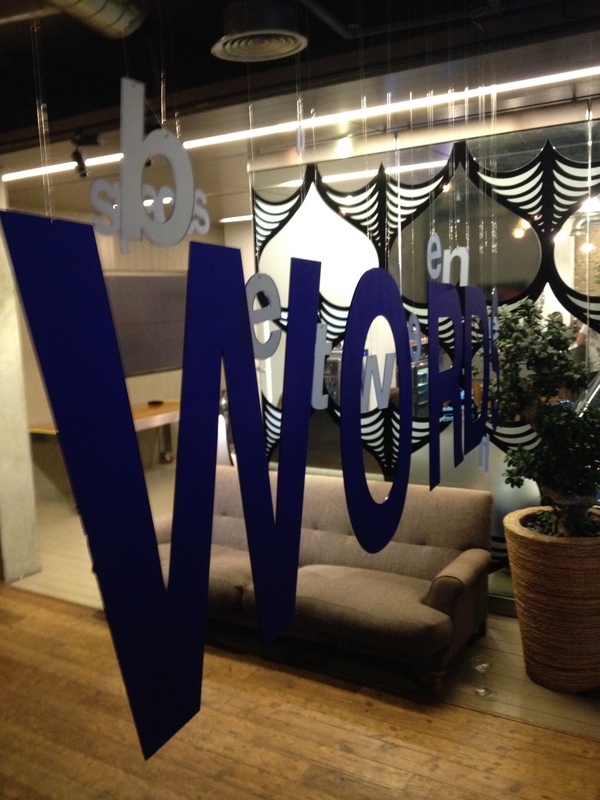 For this we had weekly meetings and scheduled artist talks, workshops and crits. March saw the success of DIY Art School continue as I was asked to represent the group by giving a speech at the opening of Castlefield Gallery’s New Art Spaces, Federation House. I was pretty honoured to be speaking along side the likes of Maria Balshaw, Director of the Whitworth Gallery and Manchester Art Gallery. Jumping ahead to May and I was selected as one of the UK representative artists for the ‘Art of Youth’ Youth in Action European Commission project in Montenegro. 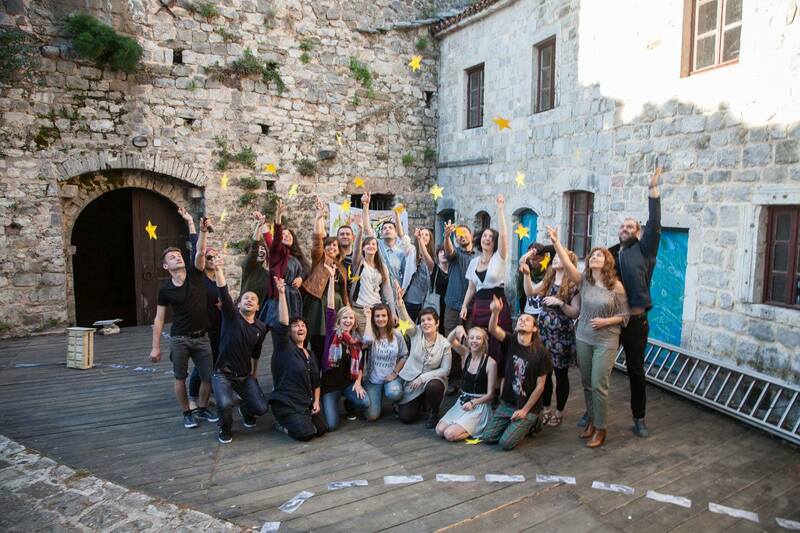 The programme brought together participants from across Europe to learn about different contemporary art practices, European Citizenship, and to create collaborative pieces of artwork to be exhibited in the open air amphitheatre in Old Bar, Montenegro. As well as being creatively stimulating and getting to exhibit in such an unusual space, I also made many friends that I’m still in contact with today. 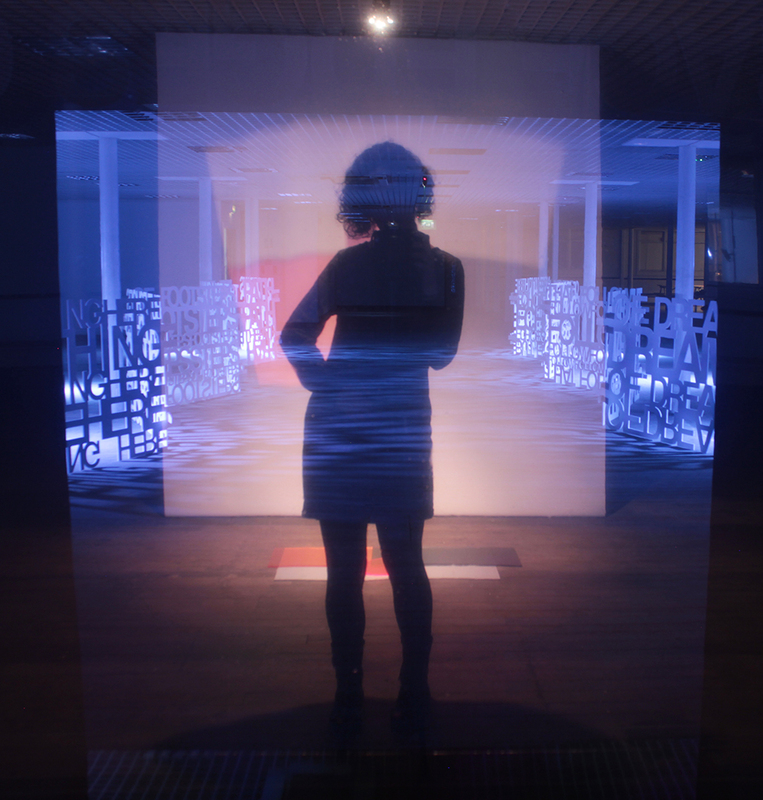 I was over the moon to get Arts Council England funding in June for ‘Light Holds Me Here‘ a period of research and development of my practice to help to fuse my two creative backgrounds of light art and writing. This project helped to shape the rest of the year as I was working towards a solo exhibition and to show work in the Faroe Islands later in the year. I also started working with Curated Place, who supported my application and my progress throughout the year. In July I also began a new research project, Manifest, with fellow artists, John Lynch and Roger Bygott. This also received Arts Council England funding and allowed us to look into the feasibility and planning of a festival that supported North West based artists and would run alongside the Manchester International Festival in 2015. September was a red-letter kind of a month for me. I was honoured to have been selected as Tim Marlow’s Curator Choice for Fine Art for NOISE Festival 2014. I went to the press launch at the House of Commons and found out that my winning entry ‘Sun Scroll‘ was to be exhibited at the Manchester Buy Art Fair, then at the Tetley in Leeds and also a picture of it was placed on a plinth and exhibited on London’s South Bank for nearly 3 months! I was also awarded ‘Outstanding’ for my ‘Sun Bowl’ and ‘Excellent’ for ‘Leap and the Net Will Appear’ for NOISE Festival by the CEO Denise Proctor. Alongside this, I exhibited my final work for ‘Light Holds Me Here‘ developed over the summer in a solo exhibition of the same name at Castlefield Gallery’s New Art Spaces. An absolute dream of an experience and I was really pleased with the great feedback from visitors. In October I developed and delivered a series of expressive drawing and working with words workshops with stroke survivors for the Stroke Association. 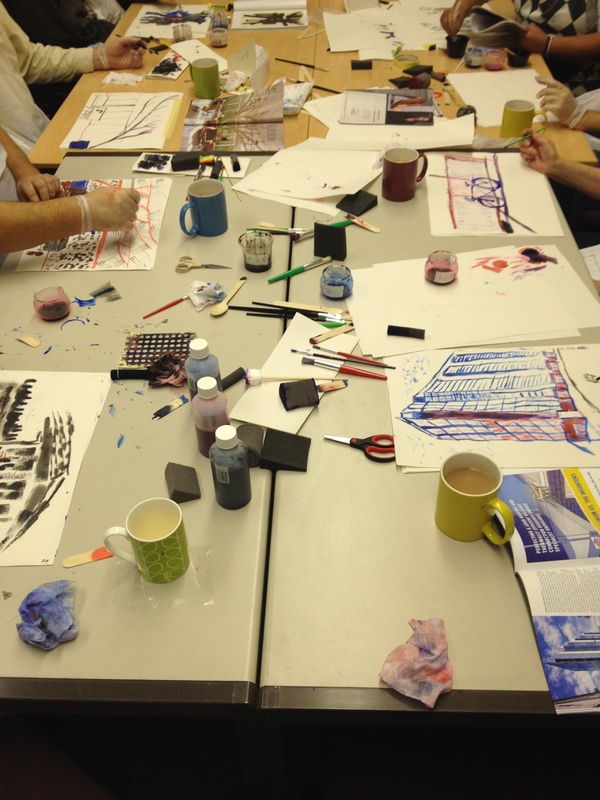 This was a new experience for me and I was pleased that the participants enjoyed it too and created some amazing artwork in the process. Curated Place took me to Copenhagen and then the Faroe Islands in November. 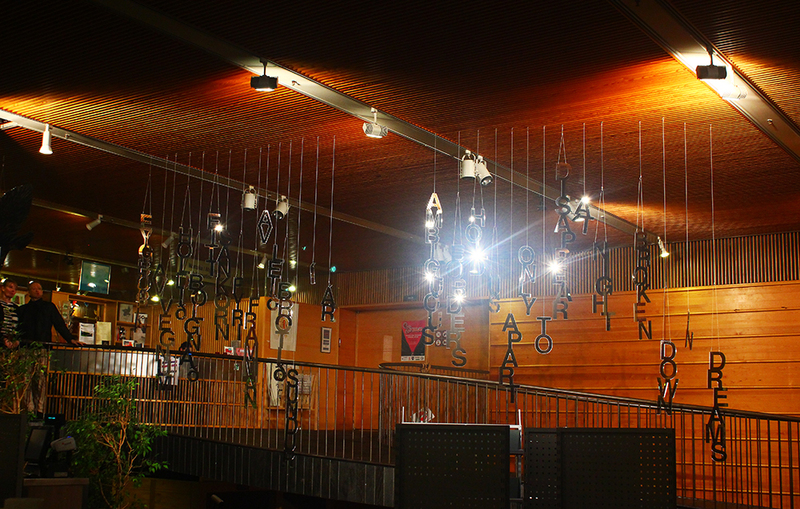 In the Faroes I exhibited a poem installation, ‘Ambiguous Borders‘ together with a poem written in response to mine by Faroese poet, Oddfridur Marni Rasmussen, at the light art and literature festival, Bóka Dagar. I also had the generous support of fellow light artist, Ulf Pederson, as he enabled me to project more of my poetry onto the buildings of the Faroese National Broadcasting house. December was another busy month as I was chosen as one of Red Bull Studios’ ‘Red Bull Collectives 2014‘. For this I got to collaborate with award-winning photographer, Layla Sailor, to creative an exhibition ‘Fragment|Reflect’ at the Red Bull Studios on Tooley Street, central London. To end the month and year, I was awarded another Arts Council England Grants for the Arts grant to create new piece of work, ‘A Solid Wish Scatters‘ for the Enlighten Manchester festival of Light Art. 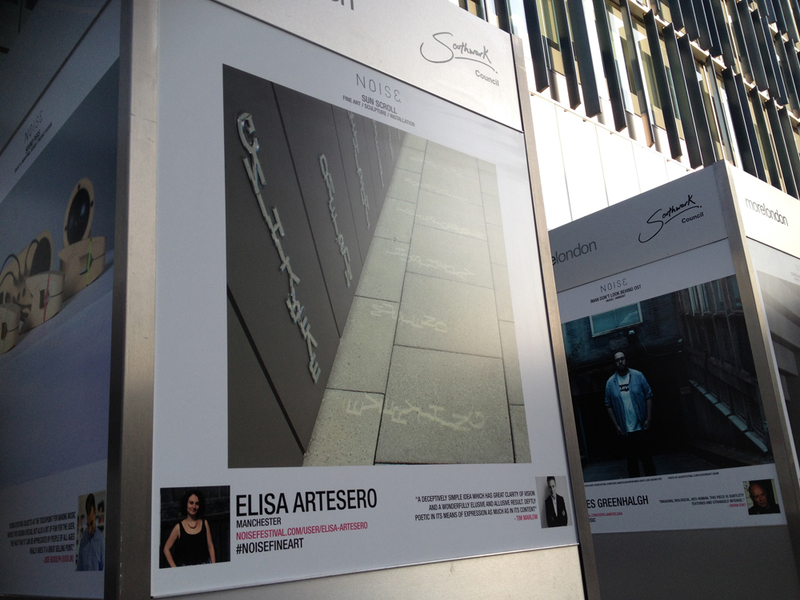 I exhibited one of my largest pieces of work yet in the centre of Manchester in Piccadilly Gardens. I couldn’t have wished for a more positive end to the year and I thank all my colleagues, sponsors and supporters who all helped to make it actually happen. A Solid Wish Scatters. Photo credit J.Lynch. 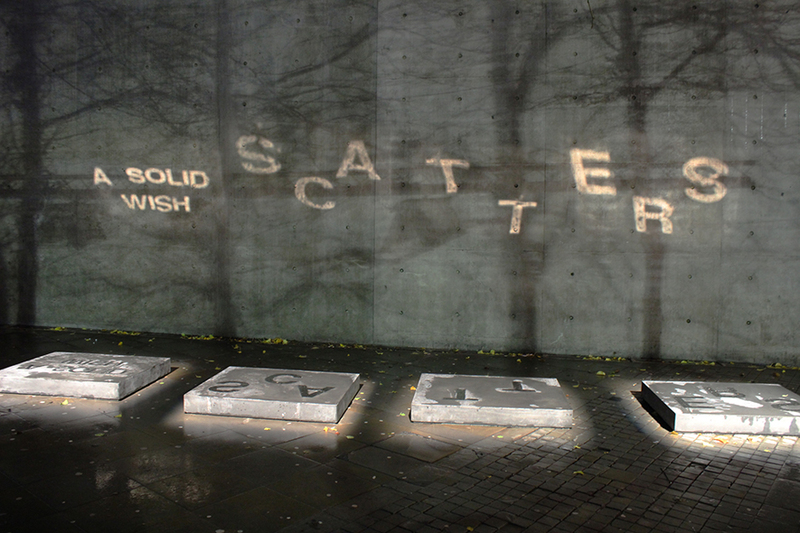 I’m really pleased to present a new public realm artwork ‘A Solid Wish Scatters’ supported using public funding by the National Lottery through Arts Council England. The work is on show now until Sunday 14th December as part of the Enlighten Manchester Festival of Light Art in Piccadilly Gardens run and produced by Curated Place. 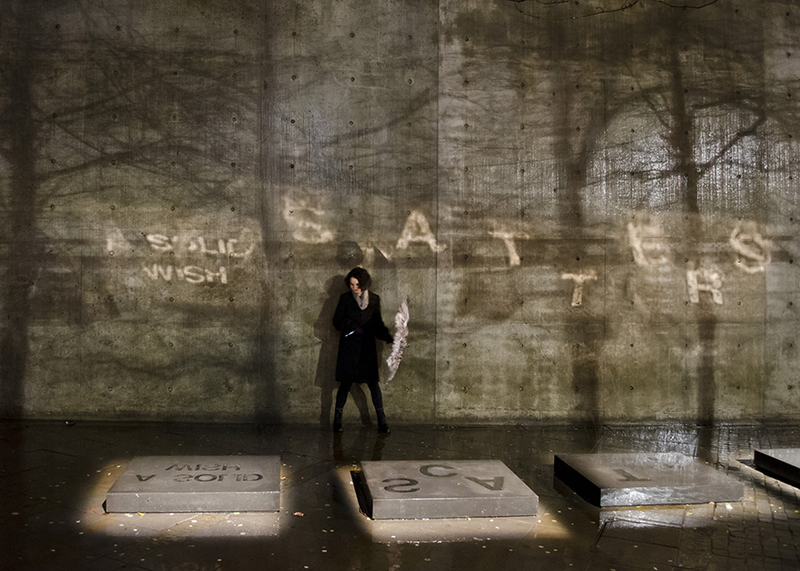 ‘A Solid Wish Scatters’ is an installation made of concrete blocks to echo the concrete of its surroundings. The words reflect up onto the famous concrete wall in Piccadilly Gardens. The earthly presence of the blocks scatter into an ephemeral light piece on the wall to show all that is solid is still fragile and all that is perceived to be permanent never will be. Its presentation here is using spotlights for the dark winter nights, however it is also a sunlight-activated work when re-located to a South-facing wall. I’ll update my blog with more pictures and maybe even some video very soon. In the meantime however, pop down to look at the work for yourself! I was recently selected as a UK artist representative for the Youth in Action, Art of Youth European Commission programme held in Montenegro. The programme brought together participants from across Europe to learn about different contemporary art practices, European Citizenship, and to create collaborative pieces of artwork to be exhibited in the open air amphitheatre in Old Bar, Montenegro. One of the things that took me, and the other three artists from the UK and Ireland, by surprise was that not all the participants were professional artists. From the selection process we had been through here, we thought it was a prerequisite. In fact, the participants from the other European countries (mainly from the Balkans) were from many different disciplines. Some were studying and others were professionals in fields such as architecture, computer science, cognitive science, art history, graphic design, law, and youth work. This turned out to be a wonderful mix, revealing knowledge, skills and different perspectives that might not have been present had the whole group been full of fine artists. It worked for lively and interesting debate about the topics concerning European Citizenship and the politics affecting each country and collectively. The training part of the course took the form of lectures about contemporary arts practice and seminars about sense of place and European Citizenship. Details of these and the structure of the programme can be found on the blog set up by Ion Creative’s Nancy Barrett: Same Difference. I’m still reflecting on the full experience of my time in Montenegro and the people that I met. I came away with a feeling of such happiness with the experience, the group had gelled so well, and considering we had many strong, vibrant characters among us, there was never any conflict, just sharing and understanding. I learnt much about the different customs in each country and the passion everyone had about keeping their own national customs and identity, but also being part of the European Union as a whole, and that this was never viewed as a dichotomy. I’m writing this on the day of the European elections with many anti-EU parties campaigning to take the UK out of the EU, precisely because they feel the UK is somehow restricted, our culture threatened and at a disadvantage by being in the EU. The main topic that came up in the Youth in Action programme was the freedom of movement, exchange of ideas and cultural experiences that being part of the EU could afford us all. To restrict that again, in my view, is to take the UK backwards, cutting off the nose to spite the face. The group I worked with were keen to learn about using light as an art form, and so we made two pieces of work, the first a sunlight performance piece, and the second a night-time light photography made one evening on the beach with us all running around with torches probably looking possessed to any passers-by who wouldn’t necessarily realise that we were ‘drawing with light’ to 15 second exposures. 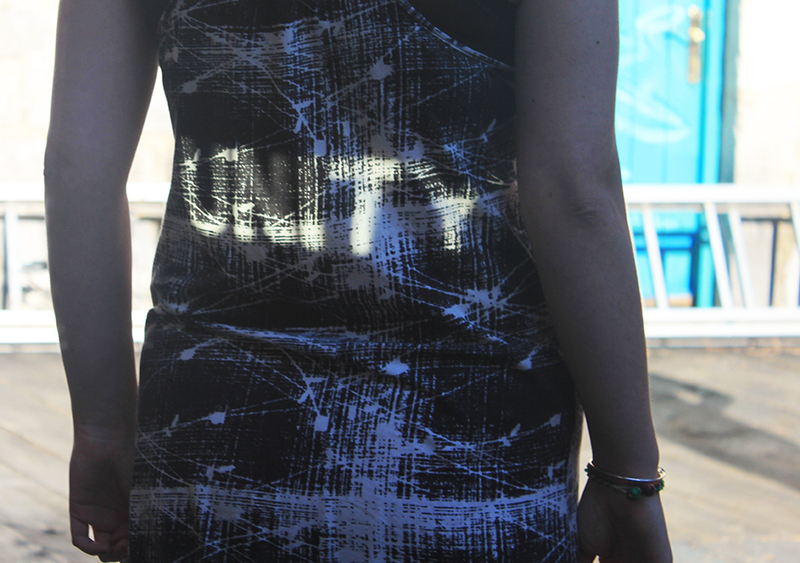 Unity is a two-part piece of work. The first is a performance using sunlight and mirrors. Five people transmit a beam of sunlight to each other in a star pattern, finally reflecting the word ‘unity’ onto the ground of the space. The unified action shows the positive effects of collaboration and understanding between EU countries. The second part is night-time light photography which addresses differences and obstacles faced through lack of understanding and knowledge of other countries. The result is a highly stylised and abstract interpretation of these issues. Other pieces of work were dancing and painting performances, installations, stop motion animation and Christo-inspired tree-wrapping. There were many other facets to this experience; for instance the intercultural nights, where we were introduced to the strangely popular musical genre of “Turbofolk” in the Balkans, awesome fast-food pastry dish of Burek, the fact that Bulgarians nod when they mean ‘no’ and shake their heads when they say ‘yes’, and some great ska and punk from Croatia. We also ate a lot of Montenegrin cheese. A lot of cheese. A wonderful experience that I’ll cherish for many years.